Advertising and marketing are an important part of promoting any business. But even before the latest, digital marketing trends were in vogue, there’s one form of promotion that has always existed: Word of Mouth (WOM) referrals. Who would ever doubt that WOM has been, and will always be, the best form of marketing money can’t buy? Every rock-star agent knows that referrals from friends, family and your best pay customers (who are already in our existing book of business) are the most effective channels to grow your agency. When agents hit this “holy grail,” they know they’re going to write quality policies that have the highest retention rates. Of course these days, referrals aren’t just WOM anymore. Referrals can come from any form of communication, including online reviews, especially when it comes to Millennial (22-36) customers. At first glance, it may seem like WOM referrals are completely opposite from online reviews. After all, Yelp reviews come from complete strangers, while a referral is usually from someone you know or have met in real life. However, the truth is, these days, the line between the two is really getting blurred. As we become more reliant on the Internet and our mobile devices, people are more likely to trust what they read online. This especially rings true for the younger generation or Millennials, many don’t know what it’s like not to have the Internet and smartphones. Just think about the last time you were searching for a product or service. What did you do first? Perhaps, if you had a wide network of friends or family, you might have asked them. But, most likely, you searched for reviews online. My wife Tonya and I love to try out different restaurants and hotels when we travel. When we recently went to Eureka, CA., we didn’t really know anyone who lived there, so we couldn’t ask anyone for recommendations. So, of course, she pulls out her smartphone and checks on Yelp and Google for the best restaurants near our hotel. In fact before we even left the SF Bay Area, she located our hotel, also, using Yelp. My wife never travels anywhere new without first checking Yelp ratings on hotels, restaurants and “things to do.” In fact on our way up to Eureka (about a 250 mile drive up Northern CA), she was able to find great restaurants using the Yelp App, which located these great restaurants using the keyword “great restaurants near me.” In addition, she selected only four or five star restaurants; before making a decision, she read at least 3-5 reviews on that restaurant, all while travelling 70+ MPH. Wow. Yelp is no longer being used, by consumers, for restaurants and hotels. Yelp reports that they now have more than 600,000 (2018) searches per month (nationally) for the insurance and financial verticals. How can I ask my customers for online reviews? The next question is, how do you get more online reviews? The answer is simple: just ask! But of course, it’s not always that easy. There are many reasons a customer might not leave a review. You might think it’s because they’re unmotivated or because they think that payment for your services is enough. However, there could be other reasons why they don’t leave reviews. “Dissatisfied customers” are much more likely to leave a negative review (and tell their friends and family) as compared to “satisfied customers.” Check out these stats: https://www.inc.com/andrew-thomas/the-hidden-ratio-that-could-make-or-break-your-company.html Many satisfied customers would be happy to leave you a review, but your team has to ask them for a review. This could be one of the main reasons why a happy customer won’t leave a review: they simply don’t know how or where to review you. One way you can remedy this is to give your customers straightforward instructions on how to do it. You might want to send them an email with the links to your Google My Business page or Facebook Business Review page, along with instructions. 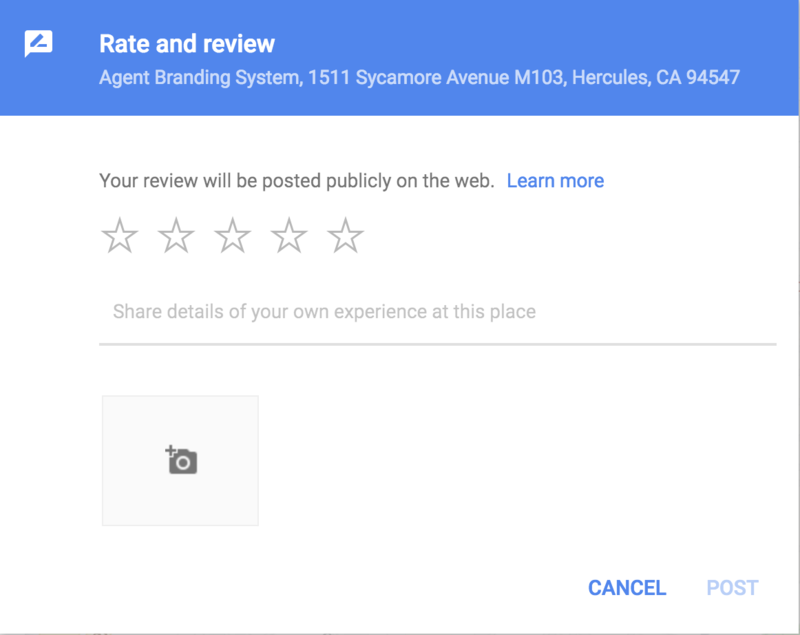 Reviewing on Google My Business is simple, but do your customers know where to go? By the way, Yelp frowns on this practice. In fact, they consider it a violation of their “Terms of service.” Yelp believes that 100% of your reviews should be “organic.” In other words, they should just happen naturally. But, in many cases, they might not think about it because you didn’t ask. So, next time you’ve made a particular customer happy, just have your team asks them to write your agency a review.. Send them a text or email, asking them for a review. You can have your team follow-up, just as a reminder. Generate real enthusiasm, during your weekly team meetings, to drive more ratings and reviews across your digital eco-system. Our top agents actually promote this strategy with contests for their employees. They give out gift cards (Amazon, Starbucks, water parks, etc) to team members who encourage customers to leave reviews. Can reviews help my insurance agency’s online reputation in other ways? 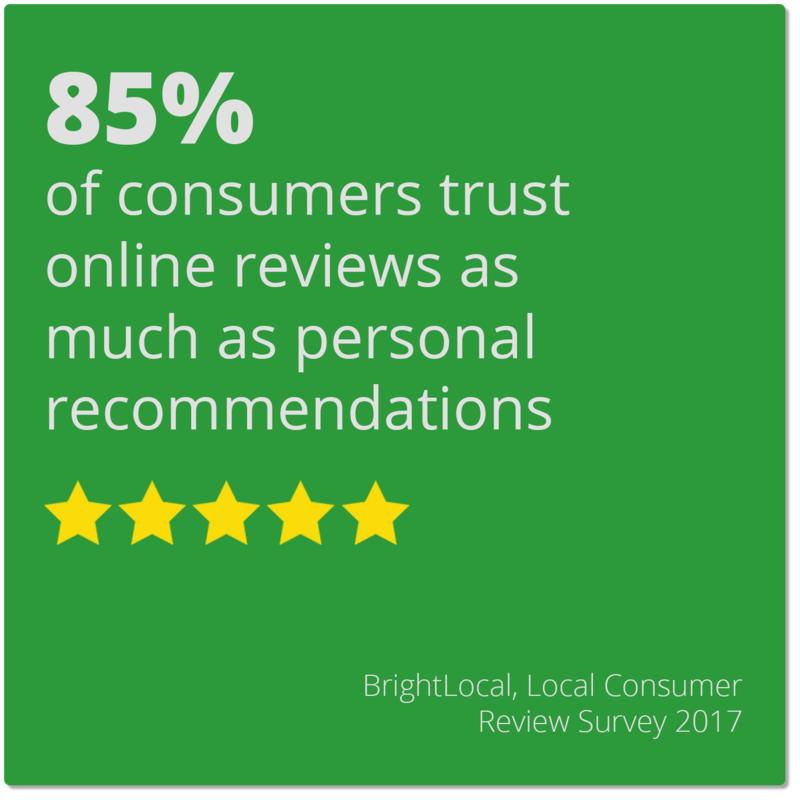 The great thing about online reviews is that it can benefit your agency, not just in helping potential customers in making their decision, but in other ways, namely, by helping you rank higher in search results on Google, Facebook and Yelp and even LinkedIN. The more quality reviews you have, the higher your ranking when people try to search for insurance agencies and services. In fact, voice search queries are on the rise. ComScore (independent, 3rd party and syndicated research firm) says that by 20020, more than 50% of all search traffic will be coming over a voice device or voice app of some sort. If someone asks Google Home this question, “Ok Google. Find me the top auto insurance agent” in your city, Google will only serve up your listings assuming you have at least a 4 star rating or higher. Isn’t that enough to motivate you to develop, and retain, a sterling online reputation? Google knows your online reputation across a number of digital platforms, especially your rating on your GMB (Google My Business Knowledge Card). It’s very smart and getting smarter by the day……well, it’s Google. However, getting reviews doesn’t happen like magic, and you will need to steer your customers toward the right direction when they write your review. While you shouldn’t tell them exactly what to write in their reviews, you should definitely encourage them to name the exact services or products that you offer, whether it’s life insurance, auto insurance, or home insurance, etc. For example: “Mary really did a good job in finding me the right auto insurance, homeowners insurance and life insurance. If you noticed carefully, you need to have them spell out your keywords (products) in their entirety, e.g., auto insurance, homeowners insurance and life insurance versus auto, homeowners and life insurance. When done properly, we’re seeing more of our top agents’ reviews show up in search results on Google, Bing and Yahoo. By naming these services, reviews can help your insurance agency rank for these terms. Again, this can help boost your search rankings on voice search. As you know many people today rely on voice-activated assistants like Amazon Alexa, Amazon ECHO, Google Home, Google Assistant, Siri, and Bing Cortana, whether it’s through mobile or stand-alone devices. If you do have one of these devices, you may have noticed that they tend to serve up results where they say, “Here are some top rated… “. Another way you can help increase your rank is to ask customers to include your location in their review, to help you rank even better in geographical searches (i.e. “Find me insurance agents in Fort Worth), etc. One reason why this is important is because voice searches can also help you determine if your potential customer is ready to buy. According the Neil Patel, people who ask “What” and “How” are usually still in the research phase (Top of funnel or Awareness>>Consideration phase of buyer’s journey). But, those who ask “Where” and “When” are ready to purchase (Bottom of funnel or Decision-Making phase of buyer’s journey). So, if you can rank for geographical locations, these voice assistants can serve you up customers who are ready to purchase insurance. How should I respond to online reviews? Once someone has posted a review, you don’t have to just leave it at that. You should definitely respond, both to positive and negative reviews. But, how should you respond? There are many ways to respond, but one thing you should definitely do is to respond as quickly as possible. I suggest 24-48 hours. That way, it looks like you are actually listening to your customers and it increases the chances of you being able to engage with them. Dialogue with those in your community is always powerful. That’s why “engagement rates” on social media are so important. It’s a similar concept while responding to reviews, both positive and negative. If you get a positive review, you can use this an an opportunity to not only thank the writer, but increase your search rank and perhaps, diplomatically ask for referral business. Notice how I used an important keyword (auto insurance), while making it sound as personal as possible. Now, if you get a negative review, you won’t use the same type of strategy. In such a case you have two goals: respond quickly and in a professional manner and move the conversation offline. If possible, you’re generally going to be better off by having a voice, or face-to-face, call with this irritated customer. The answer above is short and sweet, which is what you want to aim for when answering a negative review to avoid agitating your customer any further, but more importantly, it shows other people reading the review that you take negative feedback seriously and want to make amends. Are online reviews really necessary for insurance agents? While not totally necessary, online reviews are really useful in growing your book of business. Reviews today are the equivalent of WOM referrals, and as you may already know, such referrals are invaluable in any business. Often, when a customer comes to us because they’ve heard good things about the products and services we offer, it is easier to close and retain them. If you’re still unsure of how online ratings and reviews can help your insurance agency, I’d be happy to explain it further and give you more details. Agent Branding System is committed to helping you enhance your online reputation, and increase your brand’s visibility to turn your business into a five star agency. Call us now, Toll Free 1-800-776-7761, for a consultation!